A federal court has ruled to award Energy Northwest nearly $56.9 million in damages from the Energy Department for breach of contract involving the Yucca Mountain nuclear repository project. This decision by the U.S. Court of Federal Claims addressed the sole issue of the amount of damages. A 2006 judgment by the court already determined that the Energy Department was in breach of contract with Energy Northwest for the department's failure to begin accepting used nuclear fuel from the nuclear utility industry in January, 1998. That is the date when a national repository was to be made available to receive used fuel from more than 100 U.S. nuclear energy facilities, per DOE's 1983 "Standard Contract" with utilities. As part of the Standard Contract, ratepayers receiving nuclear energy must pay a per-kilowatthour fee to DOE for the construction and operation of a national nuclear waste repository, to include used fuel transportation costs. Since 1983 ratepayers have placed more than $33 billion into the Nuclear Waste Fund, of which more than $22 billion remains. Northwest ratepayers have paid approximately $290 million into the fund since Columbia Generating Station, near Richland, began commercial operation in 1984. The federal court order, if upheld in potential appeal, will offset Energy Northwest's project cost for the 2001 construction of a used fuel storage area at Columbia. 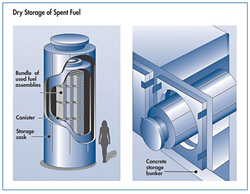 Though Energy Northwest and the nuclear power industry continue to advocate completion and use of a national repository, Columbia's used fuel can continue to be safely and securely kept for decades at the plant's above-ground dry storage area. Energy Northwest filed its lawsuit in January 2004 and sought $56,859,345 in damages at trial. The case was tried in Washington D.C. between Feb. 2 and Feb. 20, 2009. DOE has 60 days from Friday's ruling to file an appeal. According to court documents, Energy Northwest represents one of more than 60 such cases filed by nuclear utilities. Energy Northwest develops, owns and operates a diverse mix of electricity generating resources, including hydro, solar and wind projects - and the Northwest's only nuclear power plant. These projects provide enough reliable, affordable and environmentally responsible energy to power more than a million Washington homes each year, and that carbon-free electricity is provided at the cost of generation. As a Washington state joint operating agency, Energy Northwest comprises 28 public power member utilities from across the state serving more than 1.5 million ratepayers. The agency continually explores new generation projects to meet its members' needs.